Yesterday my friend Sarah’s little girl turned one and with my own daughter rapidly heading towards this first milestone its been a strange feeling. I remember visiting her in hospital when Jessica was a tiny 8 weeks premature baby and now looking at her as a happy, very healthy girl its hard not to wonder what happens to the time. To celebrate my friend asked me to help her make the birthday cake. 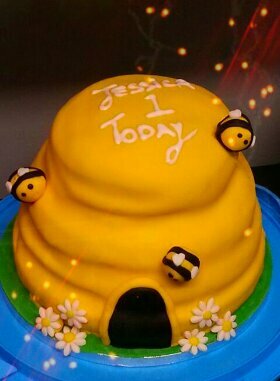 She wanted to create a bee hive cake as Jessica’s favourite teddy is a buzzy bee and yellow is her favourite colour. Between us we created something pretty good for two beginners! Sarah baked the cake layers and I did the decorating. Considering I’ve never tackled a cake more than a single layer I was ready to have a go. Luckily, after I buttercreamed the layers together and smoothed off the sides with more buttercream, it gave a pretty good beginning shape. Next step was to roll out a large amount of yellow fondant to cover and drape over. The original cake picture cut a hole out for the door but I thought it’d be (bee) easier to use black fondant to make a door shape. Lastly it was just the finishing touches, 3 little bees, a few flowers and a personal touch of the writing on the top. I wish I could have written finer but it was a late decision to do it and the writing icing we had available at the time was a little runny. If I was to do it again I’d write using royal icing and a thin nozzle. Anyway, Jessica seemed to have a fab day. Happy birthday! Next postI’m finally going to do it. I’m going to write a cookbook.